I am finally adjusting to my life on the road. I have realized that I will not be going back to my comfortable place in Philomath and I am finding my home is where ever we lay our head. I can now eat pretty well unless it is too hot or we have walked a lot during the day, then I just want to take a nap. The m0st amazing part of this adventure is Mexico! The people just love me here. I feel like some “actor” walking down the street and everyone wants a part of me. When we go out walking, every 5 feet there are people who want to touch me, love on me and they think I am so beautiful! I don’t think they have ever seen a dog so pretty or touched a dog so soft. Because of me, the Mexican people ask about me; Como te llamas? (what is your name?) , qué clase de perro es? (what kind of dog is it?) and bonito, (beautiful) then it opens up a wonderful conversation among the humans with lots of smiles, all because of ME! I am starting to finally like this new life and adventure I am on. I am now looking forward to the next place we go because there are so many people who adore me and most of all, my mom and dad are always with me and make me feel safe. The owner of La Rossa. What an amazing woman. La Rosa de Las Barras, a little bit of paradise! Little Casitas tucked away underneath a forest of palm trees nestled right along the beach. The food was fabulous! Stayed only for a night, could have stayed a week! Next stop, Mazatlan. The minute we rode into town, we were greeted by three motorcyclists from the U.S. heading to Central America. 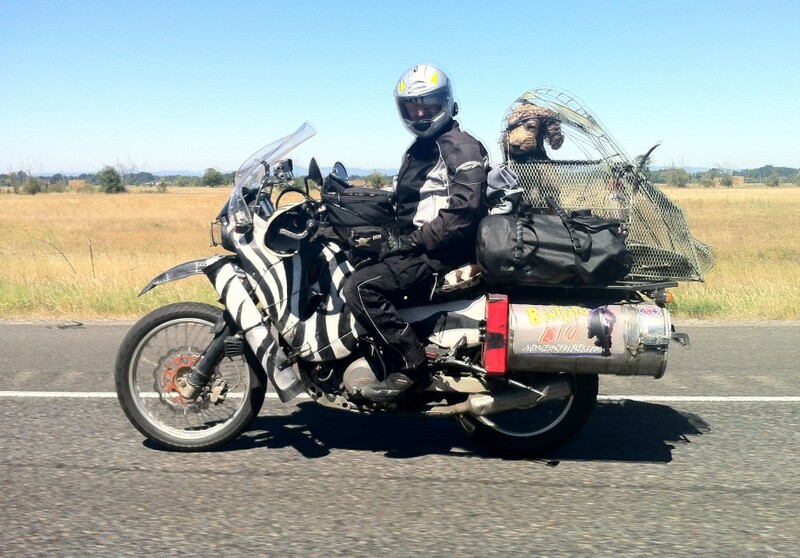 As we were visiting, we were greeted by two more motorcyclists who were locals. One who’s name is “Nacho” gave us such a warm welcome and we soon became great friends! We ended up staying in another place of paradise, a beautiful B&B called; Casa de Leyendas. Wonderful Hosts that made us and Mr. B. feel welcome. So much so, we stayed for 4 nights! The first night was a music festival that played 5 bands around the town and one of the bands was set up right outside our hotel. So much fun. We loved Mazatlan. We are now in the big city of Guadalajara. We managed to roll in at 10:00pm, in the dark… I don’t think I have mentioned the driving in Mexico. Incredible, never seen anything like it. Our first experience was on a two lane highway and a Semi is passing us and there are cars coming in the opposite direction. We moved over onto the shoulder and so did the oncoming traffic and he went on his merry way. It was like “lane splitting” going 70 on the highway. In towns, a stop sign only means; only stop if a car is coming. If you want to get around a car going to slow and you can do it passing on the right, go for it. CRAZY. Tomorrow we head to Guanajuanto and San Miguel Allende. We will spend a couple of days there and skirt around the “huge” Mexico City to Pueblo. We are really having so much fun in Mexico it will be hard to leave. Three motorcyclists heading to Central America and two “local” motorcyclists from Mazatlan. First I want to tell you about all the absolutely amazing people we have met so far. Mainly because I don’t ever want to forget them and their kindness to help us make our way! As we left Peoria, AZ we got about an hour into the trip just itching to get into Mexico, we had to make a fuel stop. It is pushing 100 degrees mind you, so the coast and the Sea of Cortez was sounding pretty good. Got fuel, got on the bikes and WHAMO (remember that word from the past post…)Scott’s kick stand breaks off just as he is getting on the bike and as he is saying; Susan come help…and as I am registering in my head; “come help” the bike falls over and proceeds to take my bike down with it, breaking off my kickstand! Oh, and Bentley is sitting sideways in his crate, unbelievably clueless to what has just happened, thank goodness for that! So in the now 105 degree heat we are searching for a place that does welding. We find this shop called Twisted Alloy, owned by Rich. He let Scott use his welder and whatever tool he needs to do the job. It took about two hours and we offered him money and he would not take it! Rich, you were an angel that day and we thank you. And we are off to Mexico! We head straight for Rocky Point and what a relief it was. Cool ocean breeze! The night was beautiful as we settled into our sleeping bags for a good nights rest and then this music from far away started to play. It got closer and closer until it was so blasted loud that even ear plugs couldn’t drown it out. It went on and on until 4am. We were out of there! As we left the next morning we met Elise, another angel. Spoke perfect English. She gave us her number and email and said that if we EVER need help, call her and she will interpret for us. (and damn it, I lost the most important card of all!, Elise if you read this, please email me!) Next stop on our way out, insurance. Another man stopped and by the time we were through, he offered us his home to stay and called his friend in Cancun who told Scott how excited he was for us and please call him if we are in the area and he offered us a place to stay. It has gone on and on like this the whole way! We feel so grateful and amazed how they have so little but have everything. We in America are so consumed with ourselves and our things and technology that we can barely talk to each other let alone help out or even talk to someone from another country. Oh the lessons learned this day, to be kind and humble, smile and be nice, to look at someone without judgment and help out. We were going through Santa Ana (pronounced) Santana. Again, so damn hot. We stopped off the side of the road where there was a little bit of shade. As we got off the bike we realized we were outside someones home. The fence was made of old rusty box springs and inside the fence was a little skinny, under nourished dog. (he had water, I checked) and out comes this old man. He and Scott shook hands and smiled. He spoke no English and we of course,spoke “poko Espanol”. We tried to explain that we needed to give our dog a break. Before we knew it, he was bringing us out two chair to sit on and offered us some water, which we graciously declined. He brought out a chair for himself and we somehow communicated and joked and laughed. We offered him a banana, an apple, saltine crackers and a carrot. He ate his crackers as we visited and his poor under nourished kitten had a great meal on the crumbs that sprinkled on the ground. As we were leaving, Scott asked to take a picture. The man smiled. Then he walks away towards a ditch. Scott and I looked at each other confused. We proceeded to follow him and to our surprise was his Burro. He motioned to Scott to get on and put his hand to his face like he was clicking a camera. Ah, here’s a picture for you to take back to America! I could hardly contain myself. What a nice man. We are continuing to take it slow as we travel because of the heat and Bentley, who I might add is handling it better than we are! He is doing very well and is definitely a “super star” everywhere we go. 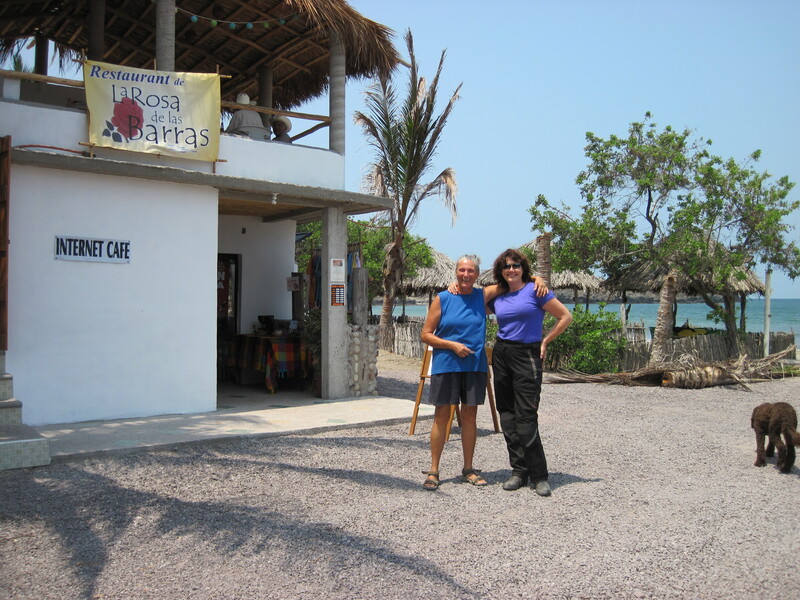 We are off to a little fishing village in Ignacio to a place called La Rosa de Las Barras which is an hour north of Mazatlan then inland to Zacatecas. Rocky Point, we made it!